Hidden Valley Hibiscus - Hibiscus Types ~ What Kind of Hibiscus are These? . What Kind of Hibiscus are These? 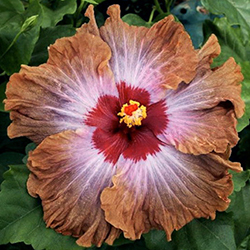 At HVH we grow Exotic, Tropical Hybrid Hibiscus. Hibiscus are a confusing group of plants! We get a lot of email all the time asking questions about the different types of hibiscus, and unfortunately for all of us, there aren't really uniform, standardized names for any of the different kinds of hibiscus. Each new type has unofficial names that have cropped up among growers and aficionados, and different groups of people use different names for the same plant, or the same name for different plants. Does this all sound confusing? Well, it should! It confuses everyone in the hibiscus world! We hope this article will help sort out some of the terminology and types of hibiscus that we find in gardens around the world. The two main groups of hibiscus that we most commonly grow in our gardens are tropical hibiscus and hardy, winter-hardy or perennial hibiscus. Tropical hibiscus, as the name describes, originated in tropical climates, stay green year-round, and do not tolerate freezing temperatures. These hibiscus are all descendants of the tropical species Hibiscus rosa-sinensis mixed with seven other species of tropical hibiscus. Tropical hibiscus can only live outside year-round in warm climates where it seldom freezes, and when it does freeze, the cold spell is mild and very short. 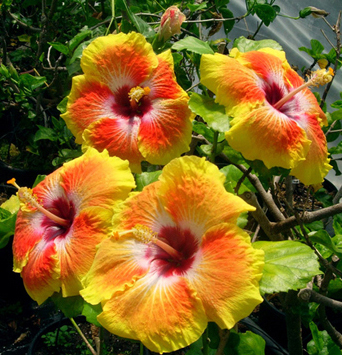 These are the hibiscus that we associate with Hawaii - the kind that are strung into Hawaiian leis, for example. All our hibiscus at HVH are tropical hibiscus, so northerners have to find ways to winter them in warm places. They have a very long blooming season, from spring through late fall, and into winter in places where it doesn't freeze. They shed a few leaves at a time all year round, so although they do shed all their leaves each year, it's not noticeable, because they are covered with green leaves all the time. Hardy hibiscus, also called "winter-hardy" or "perennial" hibiscus, are most often descended from the species Hibiscus moscheutos or "Rose Mallow", and sometimes from the species Hibiscus mutabilis or Hibiscus coccineus. Some of the ancestors of these hibiscus were native to the Americas, and all were native to colder parts of the world. Hardy hibiscus die back all the way to the ground each winter, and shoot up new growth each spring. 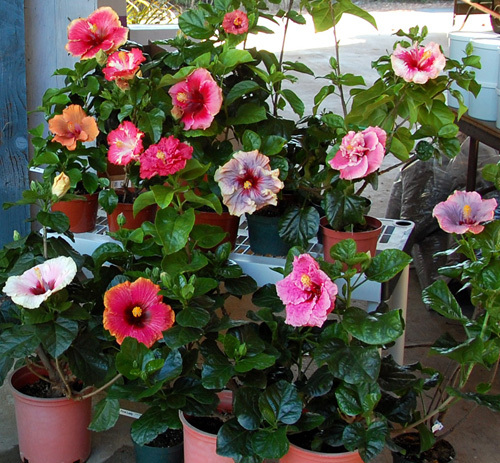 These hibiscus grow well in cold climates, but don't grow as well in warmer climates, especially hot, dry climates. Hardy hibiscus bloom in late summer or early fall and have a shorter blooming season than tropical hibiscus. At HVH we don't grow any of the hardy hibiscus. We have tried in the past, but they don't grow well in our hot, dry California climate. 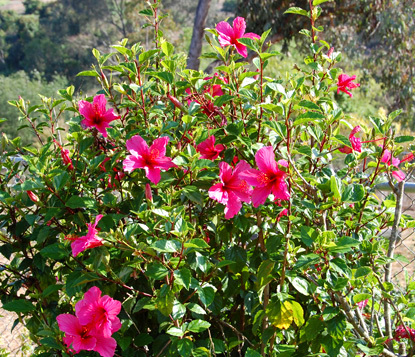 The name hybrid can be applied to almost all modern hibiscus. When we use the term at HVH, we are applying it to our tropical hibiscus. But growers of hardy hibiscus use the term hybrid too, as do all growers of all types of hybridized flowers - which means most of the flowers growing in our gardens in modern times. Hybridizing is simply crossing different species or different varieties to produce new varieties. 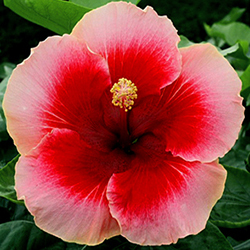 Most types of flowers can be hybridized, and almost all the hibiscus we grow today are hybrids. 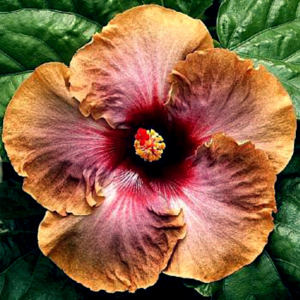 At HVH we hybridize our own new hibiscus varieties, or cultivars on a continuous basis, and each year we offer the best of our new hybrids for sale. It takes a lot of hybridizing to produce a few good hibiscus varieties. Typically, for each hundred new crosses we grow and test, only about two of the new cultivars are good enough to make it to market. The only hibiscus that aren't hybrids are the original wild species hibiscus that originally grew in the tropics of Asia and islands off of Africa. Species plants, by definition, can self-pollinate and make seeds that will reproduce the same exact plant and flower. If a hybrid hibiscus produces seeds, each seed will produce a completely different hibiscus with an unknown flower, so hybrid hibiscus varieties can't be reproduced from seed. Only species hibiscus can. For more information about the different hibiscus species that combined to create the modern hibiscus hybrids, see the Hibiscus History article on our website. We do grow and sell some of the species hibiscus at HVH. You can find them on the Ancestors Page of our Online Store. The terms garden variety and exotic hibiscus are relatively new names in the hibiscus world. Garden variety hibiscus are the ones we are all familiar with from our childhood - the simple hibiscus flowers on large bushes that grew as high as our houses. 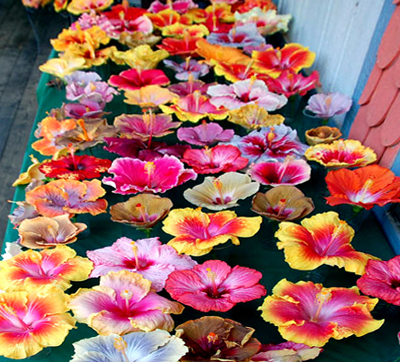 These are the hibiscus that leis are made from in Hawaii, for example. Garden variety hibiscus are all hybrids, like almost all the hibiscus we are familiar with. But garden variety hybrids are simpler, older hybrids. They usually come in only a single solid color, or possibly a mix of two colors. The flowers are small - mostly the size we now call "mini." The new, large, wildly colored, crazily different hibiscus that we grow at HVH are what we call exotic hibiscus. In some areas they are also called fancy hibiscus. Their bushes usually don't grow as big or as vigorously as garden variety hibiscus, but the flowers are much more spectacular. 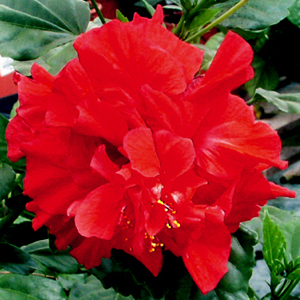 Exotic hibiscus are all tropical hybrids that must be protected from freezes in the winter. Producing such large multi-colored flowers requires good nutrition and some tender loving care, but there is nothing more rewarding than the beautiful blooms these exotic hibiscus produce. In the early days of hybridizing exotic hibiscus, few cultivars, or varieties, could be grown on their own roots. So almost all exotic hibiscus were grafted onto a tougher garden variety type of rootstock. With the newest modern cultivars this is changing. Cultivars are being hybridized for their ability to grow their own sturdy root system, so grafting is often not required with today's exotic hibiscus. At HVH we grow many of our hibiscus on their own roots, but we do also graft some special varieties that can't be grown any other way. We choose the growing method that creates the strongest, most vigorous plant for each cultivar we grow. Does this help explain all these confusing terms? We hope this article gives you a reference to look them up again if you forget what something is and need to know!